Hello friends! As you may know, my birthday just came and went. I always get a little introspective on my birthday and I think about how I’ve spent my last year and what I’m doing with my life. Then it occurred to me to write down a spread in my bullet journal to commemorate the day and create a birthday time capsule! How can I resist? One of the neat things about the bullet journal is that I can use it as a time capsule to look back years later and see what was going on in my life. I also like the idea of writing a direct message to older me and tucking it away to find later, an Easter Egg to stumble upon in the future. 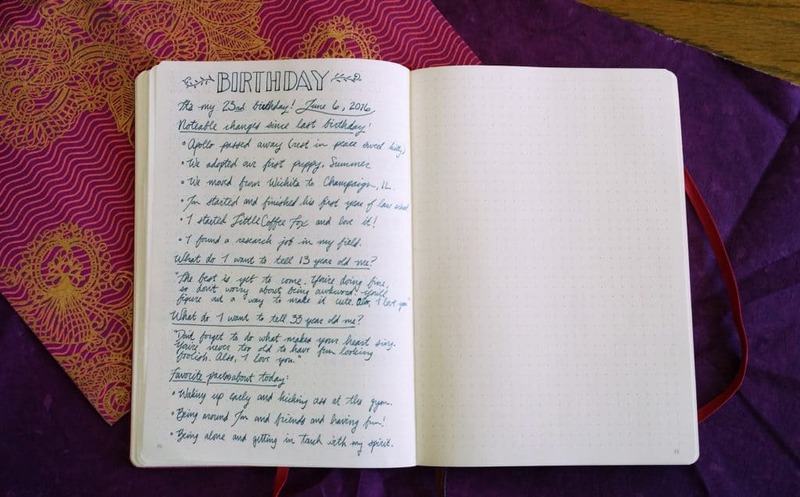 I opened to a fresh page in my Leuchtturm 1917 and wrote out Birthday – imaginative, I know. Then I wrote how old I was turning and the day, just in case I forgot. I wrote down a few major changes in my life since my last birthday so I can remember the milestones of my recent year. It’s been a big year, to say the least! 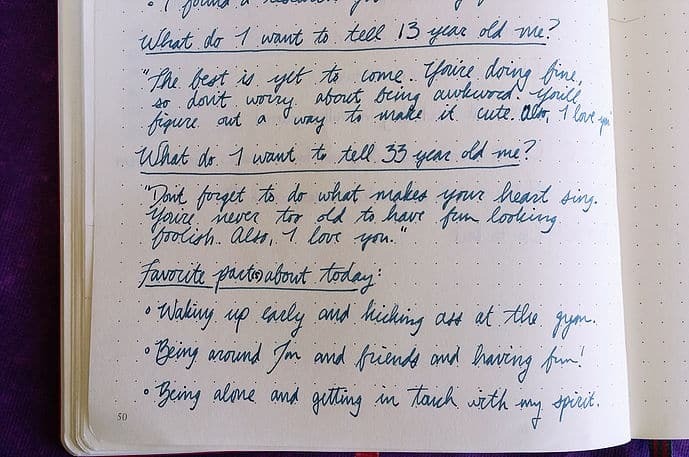 I like the idea of messages to your older self and younger self, so I decided to write to 13 year old me and 33 year old me. I think I might want to keep this tradition going, because it really makes me think of something good to say about where I am in my life at this moment. It feels important. I want to immortalize this because it will show my state of mind at this point in my life. My advice will change, surely, as I get older and wiser, so being able to look back through the years at my young advice is going to be a connection through the years to a younger, different me. It’s a nice thought, anyway. Then I just wrote down my favorite aspects of the day. It really was a fun day, being able to be productive and lazy, alone and with friends. I don’t know about best birthday ever because I can’t remember the details of past birthdays, but it was really chill and I loved it. I actually wrote the spread with my birthday gift from Jon. He got me a Pilot Metropolitan, along with 10 samples of ink that I’m slowly working through. I wrote this page with Noodler’s 54th Massachusetts, which is a lovely dusky blue. I may need to get the full sized bottle because it is a gorgeous color. 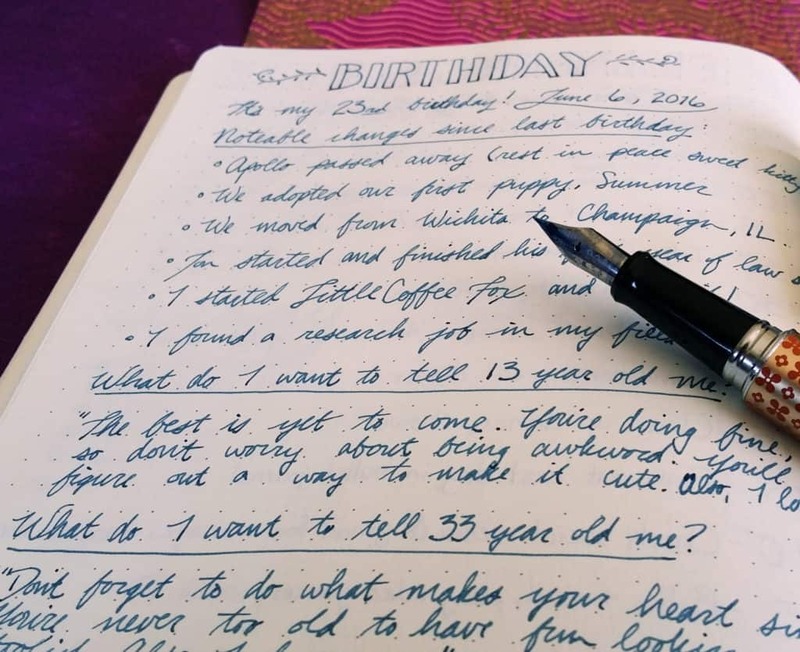 So what would you write down on your birthday page? There are a ton of things you could preserve in your journal from your recent year, so think outside of the box! Even doing this one time is a reward for future you, but it’s much better if you do it again and again. You will have a treasure trove of memories recorded in ink so you won’t forget those details. I couldn’t tell you what my specific life goals were when I was 17, so they are lost forever in a sea of speculation and doubt. Your future self will thank you for having the foresight to immortalize your current self. 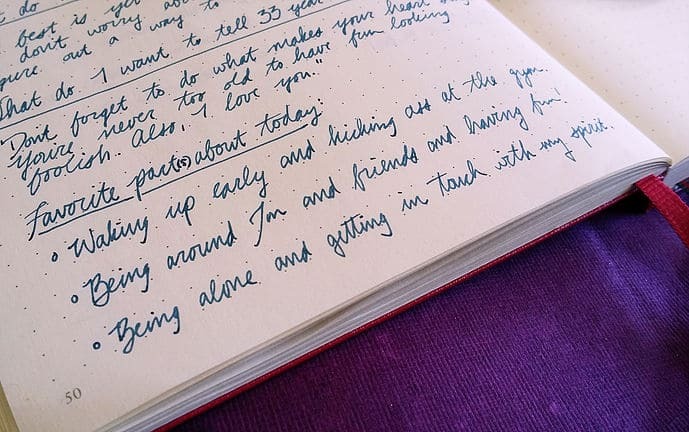 Another great method for capturing snippets of yourself for future reading is writing Morning Pages, so you could do something like this every day instead of just on your birthday. No matter how flawed you think you are or how much strife you are going through, your journey shapes who you are, and it is important to really remember your history. So write your history in the pages and reap the reward for years, even generations if you desired. Time passes quickly and before we know it, we are 23 or 35 or 50, so write it down while you can remember it. I love the handwriting for the title! Do you know what it’s called or where I can reference the rest of the alphabet in that font to see what the other letters look like? Definitely want to incorporate this font in my bujo. Love this idea! Thanks. I love this! I’ve been Bullet Journaling since February 2015, but have never really been able to keep collections like a gratitude log going. They just don’t seem to work for me. I’ve always seen my birthday as a wonderful time to reflect on what’s working, and what isn’t, in my life. Regrettably, I read this post almost a month after my November birthday, but I’m doing mine now anyway. I’ve had some big changes in the last year and seeing them all on one page has allowed me to be proud of my evolution. What a great idea! Thanks!! ???? I’m so glad you like it, Alex! I’m a huge fan of leaving little breadcrumbs in my bullet journal for my older self. 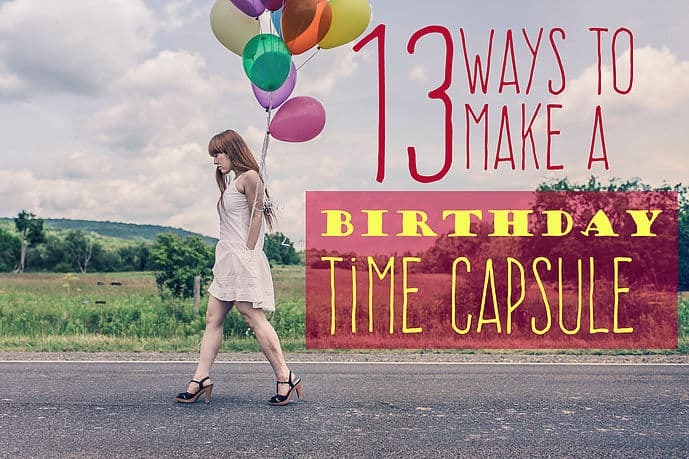 I love nostalgia, so time capsules are a great way to go. I hope you have a blast getting yours set up! What wise advice! I may have to try it on my next birthday. What a lovely idea! Its mine in a few weeks so will definitely be doing that, as years seem to rush so quickly, its so nice to be abke to look back in a few years! Well happy birthday in advance! And yes, time flies so much more the older and busier I get, so being able to look back is so fun and special. I would write myself letters, but I can never find them again! That’s why I started using my bullet journal for this, then I’ll (hopefully) never lose it!